Sue Johnson, Mac & Cheese TV Dinner with Fawn, from the Incredible Edibles, Black Set, 2007. Slip-cast vitreous china. Photo by JM Kohler Art Center/Arts Industry Program. 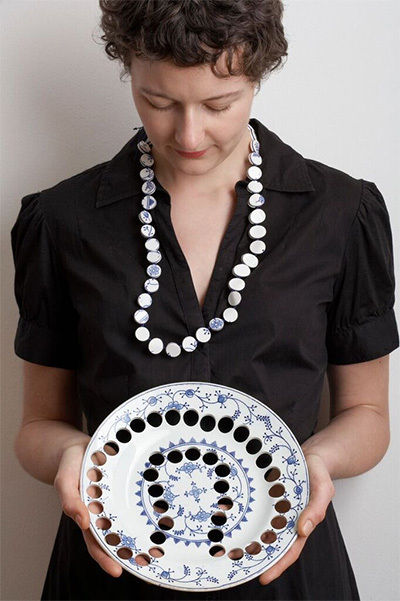 Gésine Hackenburg, Kitchen Necklace, 2006. Old and antique earthenware, thread. Photo by Corriette Schoenaerts. Although we may take it for granted as a simple tool, the plate is also a small stage—an intimate setting on which universal routines of daily life take place. 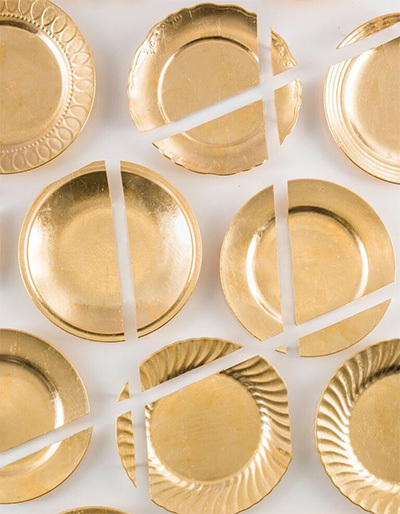 In At Your Service, Houston Center for Contemporary Craft takes into consideration the power of the plate. 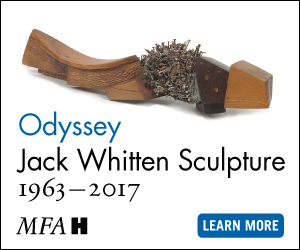 On display through May 8, 2016, this exhibition showcases the work of 12 artists who explore the dish’s untapped potential for cultural commentary. 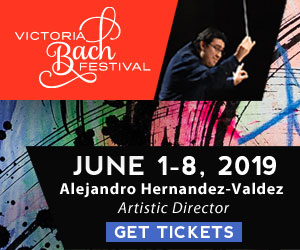 By playing with proportions, cutting, painting, and sandblasting, At Your Service lifts a most familiar tool up off the table, liberating it through metamorphoses that are attractive, humorous, and unexpected. Hybridizing fine art and craft, artists Molly Hatch and Ariel Brice both use traditional imagery in experimentations with the plate’s decorative potential. Hatch’s Versailles Orangerie: After Rigaud is a set of 78 dishes, displayed on the wall in a rectangular form. Hatch uses the plates as a canvas to recreate a print by eighteenth century draftsman Jean-Baptiste Riguad. Negative spaces between the pottery pieces interrupt the scene of richly dressed figures, lush landscape, and grand architecture to present the image as a compilation of circular snapshots. As if observed through binoculars, the arrangement feels slightly voyeuristic, but also references perception as a process of compilation. Like Hatch, Ariel Brice too appropriates a historical image in fragmented form. With assistance from Yan JiaFei, Wang Hui’s painting A Thousand Peaks and Myriad Ravines is recreated on the rims of 30 mass-produced Chinese plates. The resulting Artifact Stack is a painting in the round that recalls historical decorative vases, as well as modern abstraction and minimalism. In another explorative approach, existing plates are given new decorative life and cultural meaning. In God & Country, Niki Johnson (who curated the exhibition with artist Amelia Toelke) repurposes the commemorative plates of rural American churches. Once the focus of the plates’ designs, the image of each church has been carefully sandblasted away, leaving only ghostly outlines of the buildings behind. In the churches’ absences, the scenes’ full trees, billowing clouds, and placid skies emerge as alternative spaces of sanctuary and reflection. This recalls romantic and transcendental themes while also nodding to cultural anxiety about the “disappearance” of religion in America. Amelia Toelke, Light and Shadow (detail), 2012. Altered plates and faux gold leaf. Photo by Jim Escalante. Finally, several artists embrace the innate opportunity to discuss contemporary food culture through dishware. Emily Loehle presents elements of the nutritional pyramid on four dishes in Food Group Plates. Glazed in glossy white, the slip-cast forms of fresh foods (notably fruits and vegetables) and a significant proportion of processed cuisine (in boxes, bags, and cans) jut out from the plates’ surfaces. While Food Group Plates reveals the variety in our diets, it also reminds us of pervasive processing within the contemporary food market. Similarly, Sue Johnson’s Incredible Edible Series – Black Set analyzes consumption. 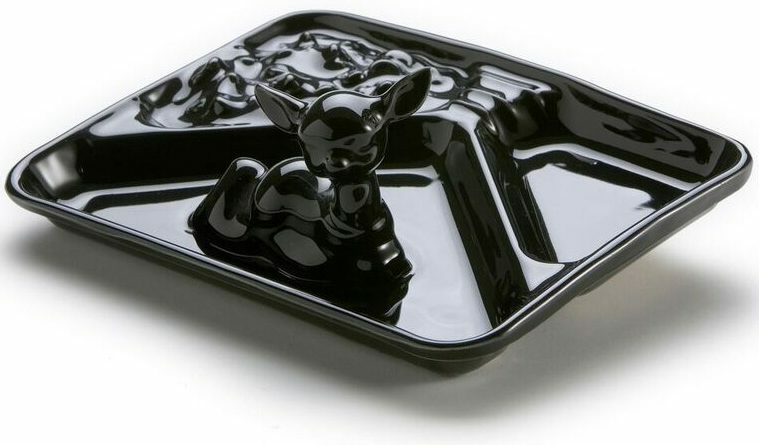 Emerging from the glistening black glaze of Johnson’s meal-filled dishes are the forms of kitschy figurine animals—fawns, turtles, lambs, and pigs. While the figures’ hyper-cute stylization and the works’ playful titles contribute elements of humor, the overall effect of the series is unnerving. Johnson shows our food in both its original/whole and final/cooked states to satirize modern man’s separation from the true origins of his meals. By changing the form of the plate, an artist can alter its utility. Yet, by using such a commonplace object for art making, references to the both contemporary and historical culture remain abundant and available. Despite altering its shape, the plate remains an object for everyone—a fact that makes the clever cultural examinations of At Your Service both absorbing and pleasantly accessible.